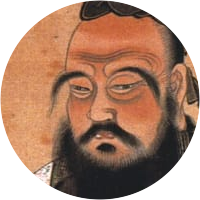 A collection of the best Confucius quotations. Men's natures are alike; it is their habits that carry them apart. One joy dispels a hundred cares. When the wind blows, the grass bends. It is better to play than do nothing. He who will not economize will agonize. Seek not every quality in one individual. Do unto others what you want done unto you. Always and in everything let there be reverence. The Essence of Knowledge is, having it, to use it. The grass must bend when the wind blows across it. Better a diamond with flaws than a pebble without. Settle one difficulty, and you keep a hundred away. Everything has its beauty but not every man sees it. The superior man is distressed by his want of ability. Do not to others as you would not like done to yourself. To see what is right and not do it is the worst cowardice. A truly great man never puts away the simplicity of a child. To be wealthy and honoured in an unjust society is a disgrace. The superior man is firm in the right way, and not merely firm. Eat at your own table as you would eat at the table of the king. Heaven will be inherited by every man who has heaven in his soul. The superior man is distressed by the limitations of his ability. The strength of a nation is derived from the integrity of its homes. When a wise man points at the moon the imbecile examines the finger. Consideration for others is the basis of a good life, a good society. Never contract friendship with a man that is not better than oneself. If you enjoy what you do, you'll never work another day in your life. It is a man who makes truth great, not truth which makes a man great. To see what is right and not do it is want of courage, or of principle. The wise man wishes to be slow in his words, and earnest in his conduct. Virtue is never left to stand alone. He who has it will have neighbours. One who merely knows right principles is not equal to those who love them. You will never know how sharp a sword is unless it's drawn from its sheath. Every one calls his son his son, whether he has talents or has not talents. The nature of men is always the same; it is their habits that separate them. The superior man wishes to be slow in his words, and earnest in his conduct. Virtue is not left to stand alone. He who practices it shall have neighbors. If a man takes no thought about the distant, he will find sorrow near at hand. Learning without thinking is time wasted; Thinking without learning is dangerous. The gentleman understands what is right, whereas the petty man understands profit. Don't worry that other people don't know you; worry that you don't know other people. Men may be made to follow a path of action, but they may not be made to understand it. Don't complain about the snow on your neighbour's roof when your own doorstep is unclean. A true teacher is one who, keeping the past alive, is also able to understand the present. Men of principle are sure to be bold, but those who are bold may not always be men of principle. Those who are meant to hear will understand. Those who are not meant to understand will not hear. If you would one day renovate yourself, do so from day to day. Yea, let there be daily renovation. In old days, men studied for the sake of self-improvement nowadays men study to impress other people. We take greater pains to persuade others that we are happy than in endeavouring to think so ourselves. Surely it is the maxim of loving kindness—do not unto others what you would not have them do unto you. Learn as though you would never be able to master it; hold it as though you would he in fear of losing it. Fix your mind on truth, hold firm to virtue, rely on loving kindness, and find your recreation in the Arts. The heart of a wise man should resemble a mirror, which reflects every object without being sullied by any. Every truth has four corners: as a teacher I give you one corner, and it is for you to find the other three. If the wise man achieves something, it is well; if he achieves nothing, it is also well; he recognizes destiny. If I am building a mountain and stop before the last basketful of earth is placed on the summit, I have failed. Women — if you are friendly with them, they get out of hand. And if you keep them at a distance, they resent it. If a man keeps cherishing his old knowledge, so as continually to be acquiring new, he may be a teacher of others. The nobler sort of man emphasizes the good qualities in others, and does not accentuate the bad. The inferior does. That which is proven by time cannot be assailed by man, while that which is disproved by time cannot be justified by man. If names are not correct and language be not in accordance with the truth of things, affairs cannot be carried on to success. He who is really good can never be unhappy. He who is really wise can never be perplexed. He who is really brave is never afraid. In a country well-governed, poverty is something to be ashamed of. In a country badly governed, wealth is something to be ashamed of. When you know a thing, to hold that you know it, and when you do not know a thing, to allow that you do not know it—this is knowledge. When you know a thing, to hold that you know it, and when you do not know a thing, to allow that you do not know it: this is knowledge. The superior man is distressed by the limitations of his ability; he is not distressed by the fact that men do not recognize the ability he has. Women and people of low birth are very hard to deal with. If you are friendly with them, they get out of hand, and if you keep your distance, they resent it. I am not concerned that I have no place; I am concerned how I may fit myself for one. I am not concerned that I am not known; I seek to be worthy to be known. There are three marks of a superior man: being virtuous, one is free from anxiety; being wise, one is free from perplexity; being brave, one is free from fear. Shall I teach you what knowledge is? When you know a thing, say that you know it; when you do not know a thing, admit that you do not know it. That is knowledge. To be able under all circumstances to practice five things constitutes perfect virtue; these five are gravity, generosity of soul, sincerity, earnestness, and kindness. By three methods we may learn wisdom: First, by reflection which is noblest; second, by imitation, which is the easiest; and third, by experience, which is the bitterest. To be able under all circumstances to practice five things constitutes perfect virtue; these five things are gravity, generosity of soul, sincerity, earnestness, and kindness. Instead of being concerned that you have no office, be concerned to think how you may fit yourself for office. Instead of being concerned that you are not known, be worthy of being known. To put the world in order, we must first put the nation in order; to put the nation in order, we must first put the family in order; to put the family in order; we must first cultivate our personal life; we must first set our hearts right. Lead the people with administrative injunctions and put them in their place with penal law, and they will avoid punishments but will be without a sense of shame. Lead them with excellence and put them in their place through roles and ritual practices, and in addition to developing a sense of shame, they will order themselves harmoniously.